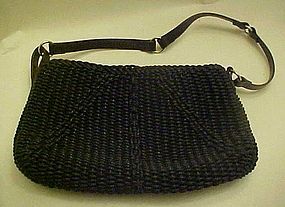 A very pretty vintage 1970's purse with the LULU label inside. Made of soft blue suede with nylon lining. 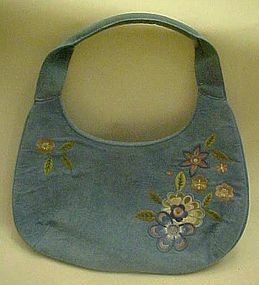 Pretty machine embroidery flowers on the suede. Inside zippered side pocket. Heavy brass snap closure. 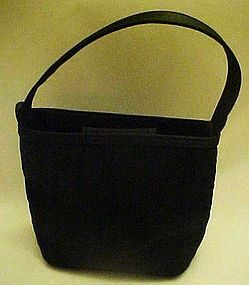 Purse is excellent, with no wear or soiling. Possibly never used, just stored. 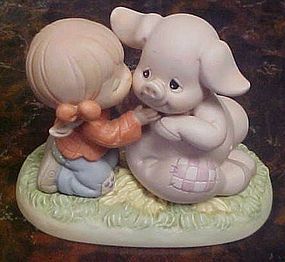 You Are My Favorite Star #527378 This Precious Moments figurine was first released in 1992 and was retired in 1997. 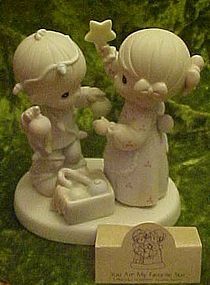 It depicts a boy and a girl playing with a box of Christmas decorations. 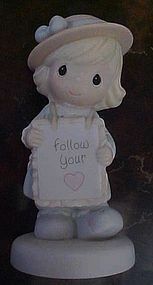 This particular figurine bears the 1992 production mark of the Clef, indicating it is from the first year of production. 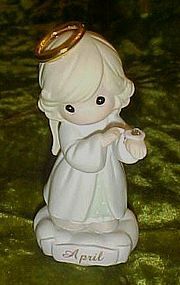 Measures 5 1/2" tall. Pristine condition and original Id card but no box. 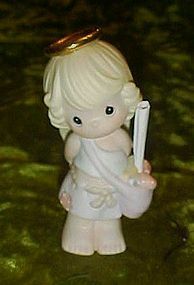 Enesco Girl Birthstone Angel has a sparkling rhinestone "diamond", which is the April birthstone - Precious Moments #261300 figurine. Measures 3 7/8" tall. Perfect but NO box. 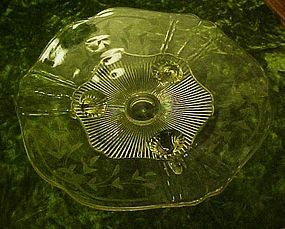 Beautiful depression glass shallow bowl that sits on three little feet or toes. Rayed center design with floral swag cutting along the rim. No idea what company made this lovely piece or the technical color name of the yellow. Measures 10" in diameter and is simply gorgeous. Pristine condition. All hand blown tall bud vase is a pretty yellow color with clear footed base. Millions of tiny little seed bubbles can be seen in the glass. Measures 11 1/8" tall. Perfect condition. Perfect for one, two or three flowers. Top opening measures 2 1/2". 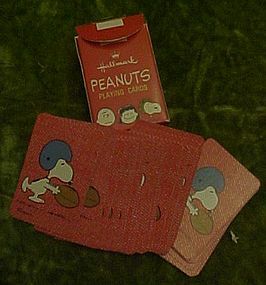 Cute and colletible deck of mini Peanuts playing cards 1 5/8" x 2", by Hallmark featuring Snoopy and a football. Each face card has a Peanuts character. Lucy is the Queen (of course), Charlie brown is the king, Linus is the Jack, and Snoopy is adorable as the Joker card. Cards are all excellent and box has a few corner bumps. Very nice for the Peanuts collector or general card collector. 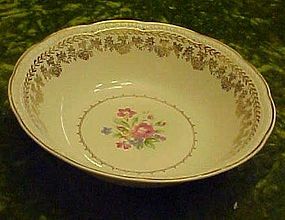 Lovely large vegetable serving bowl made by Stetson in their STT1 pattern. Floral center,and edge border of gold laurel swags,scalloped border and relief trim. Bowl measures8 3/4" diameter and is 2 1/4" deep/ No wear, or damages. Gold is bright and shiny. 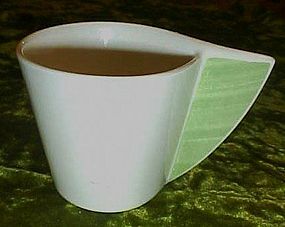 Discontinued pattern by Villeroy and Boch. I have a single cup in the palm leaf pattern. 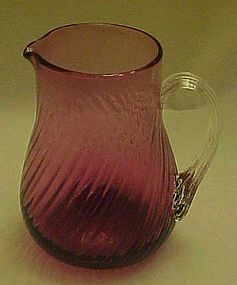 Measures 3" tall to the top of the handle and is in perfect condition. 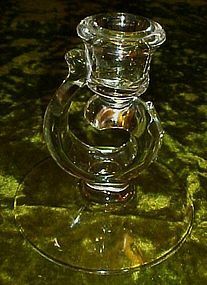 Beautiful single Fostoria century candle holder. 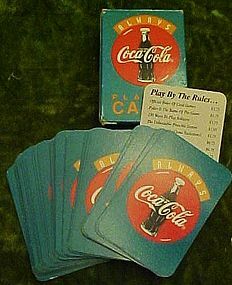 Century was introduced in 1950. 4 1/2" tall clear candle holder. Excellent condition and sold as a single. We will also be listing an identical pair. Cameo blue 1965 Jim Beam specialties decanter. 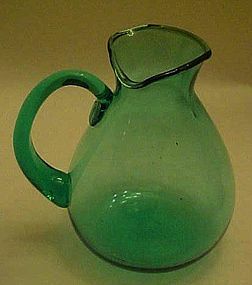 Distinctive square shouldered bottle in blue cameo glass with swite stenciled shepherd scene on the four sides of the decanter SIX SIDED, with WHITE STOPPER. THE BOTTLE is 12 3/4 INCHES TALL. The bottle is in wonderful condition. I have three available, some have partial stickers, and one, all the labels have been removed . No damages at all. Price is per bottle.